One hot July day, I was fishing just north of Sand Bass Pass with a Prune Picker Slab, 2 ounce. I had it all customized. That is, red hook with flashabou tied on the hook. Strikes were hit and miss. I finally caught a small striper and I cut open his stomach to find very small shad. That answered my question as to why I could see plenty of fish on the screen but wasn't catching any. My lure was simply too big. So, I tied on a 1.0 ounce Ghost Minnow Slab. I was in 18 feet of water and the first time I dropped the slab, a fish hit it before it had dropped 10 feet. I had never used a Ghost Minnow Slab before. I had heard of folks using them for Sand Bass and that is really why I had bought a few and threw in my tackle arsenal. But that hot July day, the Ghost Minnow Slab became a permanent weapon. I caught 300 stripers that day on a 1.0 ounce Ghost Minnow Slab. I actually caught more than that but lost count at 300. What a blast! 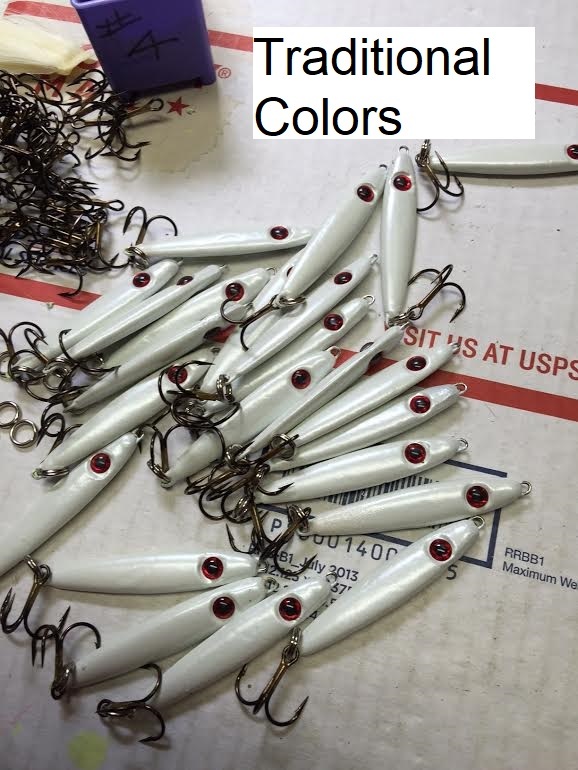 I am proud to start offering this lure from ReAxtion Lures. The bodies are durable and come in many fish attracting colors. I hope you will find them as productive as I do. Buy several so that you are covered. BE SURE TO USE A TEASER!!! BUY NOW !!! GET A HUNCH; BUY A BUNCH!!! BUY A DOZEN, I'LL SHIP 'EM IN A UTILITY BOX! !